I hope this post finds all of my fellow east-coasters safe and dry as Sandy makes her rounds! If you still have time to get out before it hits or if you’re lucky enough to not be affected, then this recipe would be a perfect one to have on a cold night like tonight! 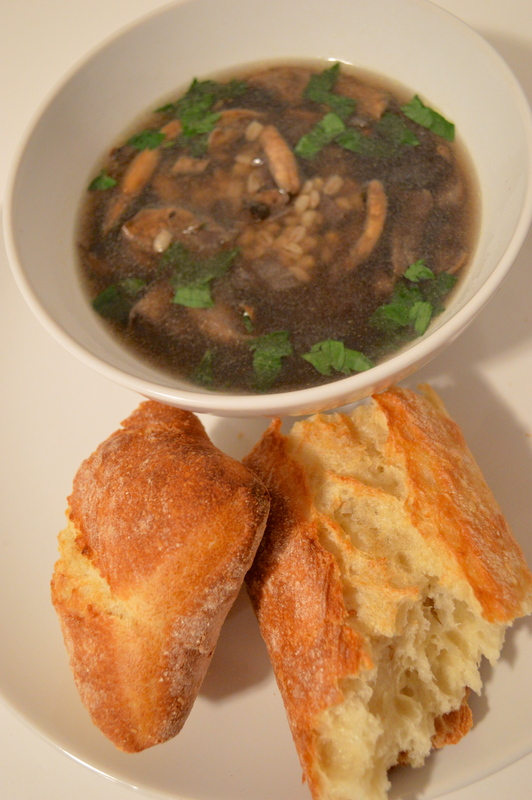 A mix of barley and fresh mushrooms packed into a broth that gets most of it’s flavor from the last minute addition of lemon juice and parsley so you get all the comfort from a nice hot soup without having to feel guilty about it! This is pretty quick to make which is another plus and if you can find quick-cooking barley then you can have it ready to serve even sooner! Freshly baked bread makes the perfect side for this, our bakery was just putting out ciabatta right out of the oven when we were there so that’s what we had. We had a lot leftover which is always great for lunches throughout the week! 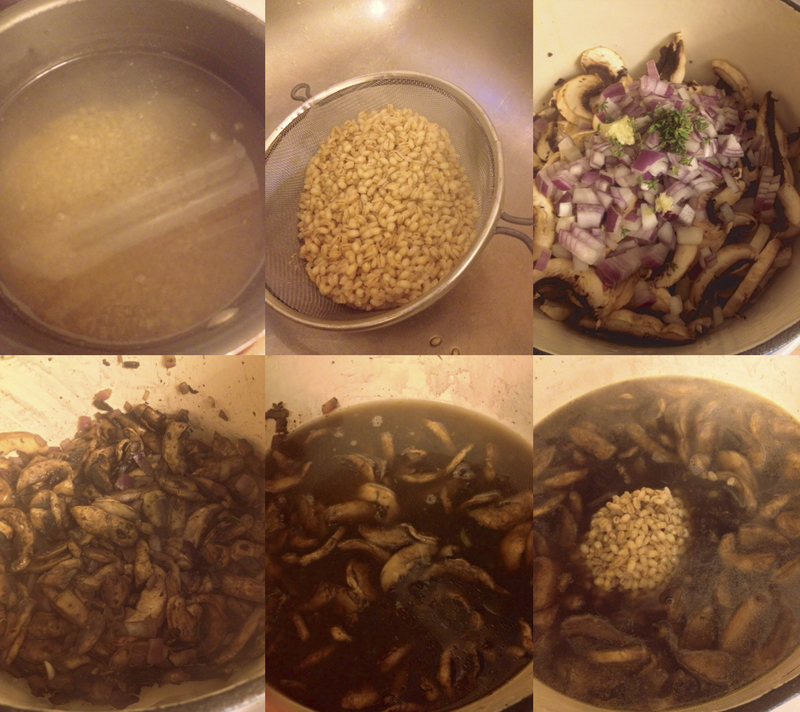 If you don’t have quick-cooking barley (which I didn’t) then start by boiling a pot of water and add 1 cup pearl barley. The barley will cook for about 10 minutes once added to the soup, so it only needs to be in the boiling water for about 30 minutes… I just kept it in there for as long as it took me to prep the rest of the soup ingredients, then drained it. While the barley is cooking, heat 1 tbsp extra virgin olive oil over medium-high heat in a dutch oven. Add 1 1/2 lbs white mushrooms that have been washed and sliced, 1 medium red onion that’s been chopped, 2 cloves of garlic that’s been pressed or minced and 1 tsp dried thyme leaves. Stir well, season with salt and pepper and then cooking stirring occasionally until the vegetables have softened (6-8 minutes). Add in 4 1/2 cups low-sodium chicken or vegetable broth and 2 cups of water and bring to a boil over high heat. Reduce to a simmer and stir in the barley (either the pre-cooked barley from earlier, or 1 cup quick-cooking barley). Cook until tender, about 10 minutes and then remove from the heat. Stir in 1/4 cup flat leaf parsley that’s been chopped and 2 tbsp fresh squeezed lemon juice. This sounds really good! When I (pre)cook barley, I cook it in chicken broth or boiling water with Knorr chicken bouillon in it. The flavor change is amazing! What a fantastic idea! Barley can be pretty bland so I’m sure that adds a nice boost of flavor! Hi! Just wanted to let you know that I nominated you for the Liebster Blog Award. If you’d like to participate just go to http://thedreameryblog.wordpress.com/2012/10/30/award-time-liebster-blog-award/ for more details! I always love reading about the new things you are creating! !